I’m probably like a lot of you guys. I’m just busy, and too often take the easy way out and steam or microwave my veggies. About 9 times out of 10. Other times I’m making a one pan, sheet pan or skillet meal. Hey, sometimes it’s just about getting dinner on the table. There’s no excuse not to make these Skillet Roasted Brussels Sprouts, though. They’re fast and easy enough for any old weeknight or anytime you want to go just a little fancier with a side. Sure, these Skillet Roasted Brussels Sprouts With Parmesan Frico are great for company or a holiday, but there are only a couple of simple ingredients. It’s the cooking method that is responsible for the over the top deliciousness. 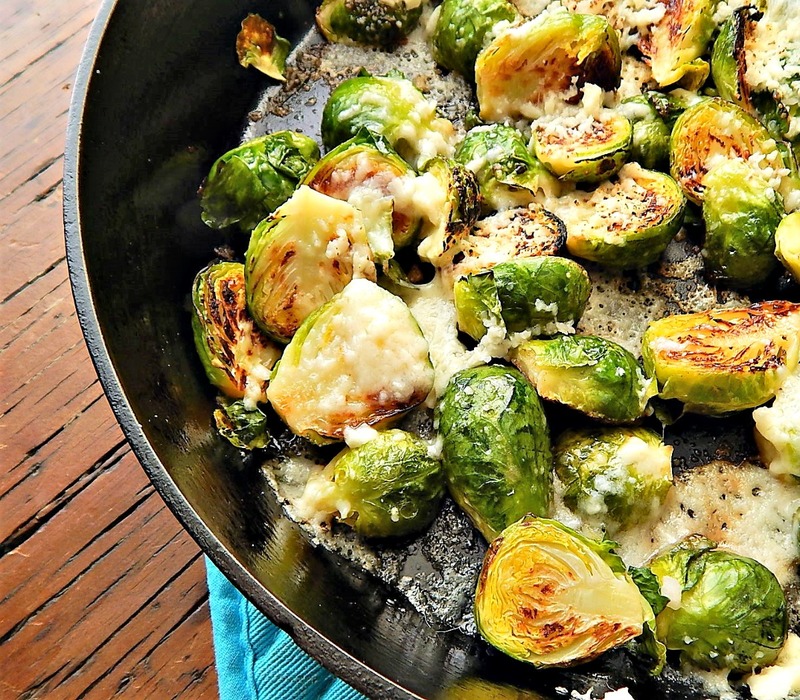 If you’re wondering about the “Frico” part of this recipe, Frico is basically a “cheese crisp.” As the cheese gets melty and drips over these Brussels to the bottom of the skillet, it forms all this golden brown deliciousness and “crisps” up. Can you imagine?! When shopping for Brussels, check the stem – they tell the story. If leaves were old and removed, you’ll see longer stems with scarring. The bud of the sprout should be tight, firm, fresh and green. Brussels Sprouts are common enough, now, to go on sale regularly. As far as cheese, it’s a pain to grate, but that’s usually the best option for pricing and freshness. If Parmesan is high, take a peek at Romano. It’s a bit more assertive, so a little goes a long way and it is usually cheaper than Parmesan. That’s a bargain in my book. Place Brussels and water in a microwave proof bowl. Cover tightly with plastic wrap. Microwave for four minutes, remove and drain well. Heat a large skillet (preferably large enough to hold the Brussels in a single layer) with butter over medium-high heat. Add Brussels in a single layer, cut side down. Add a little salt if desired. Cook until the cut side is browned. The Brussels may cook unevenly, simply flip the browned ones over as they’re done. When all the Brussels are brown and starting to soften, sprinkle the top with cheese. Turn down heat a little and cover the skillet. Cook until cheese is melted, and starting to brown on the bottom of the skillet. Uncover and toss about a tablespoon of water in the skillet, tilting the skillet to distribute the water. Allow to cook until the steam evaporates, about a minute. Remove Brussels with a thin spatula, scraping up the cheese along with the sprouts. Serve immediately. I’ll be bringing this recipe to Fiesta Friday #211, and the cohosts this week are Lily @ Little Sweet Baker and Alisa @ Livin’ Well. This entry was posted in Click here for Fabulous Food Posts and tagged Brussels Sprouts, Cheese, parmesan, Side, Vegetable Side. Bookmark the permalink. I hadn’t heard of frico until now Mollie but paired with Brussel sprouts I’d happily have this as a main meal let alone a side dish! Oh yes, it’s good enough and protein from the cheese = I had the rest for breakfast! Timely suggestion, thank you. Almost converted sprout hating husband… glad I tried it. I love this recipe. My husband always jokes about how I am a hound for the crispy cheese bits on pizza and nachos. These are right up my alley! I had the rest of them for breakfast today, lol! They don’t stay crispy, though after a night in the fridge and reheating. Still good because the cheese gets melty again. Where I have been without knowing about “Frico”!?!? This looks delicious! There ya go…now you do, and I bet you’ll be a Frico making madwoman, haha! Perfect timing! I have a bag of fresh BS in my fridge and company for dinner tomorrow; thanks, Mollie!! yep. this is a win-win! I think B S’s are my favorite vegetable. They haven’t been good lately. I thought this was their season, but maybe not?!! I think fall is more it, but then you live in the Southwest, right, so maybe. We’ve had some sad ones out here in Minnesota but that’s par for the course. Brussels and cheese combination is just amazing ! 🙂 thank you fof good idea ! Thanks! This is a fave! Sometimes I drizzle a little Balsamic on them, ,too.Even better! Thanks much! I’m glad you like the recipe. I hated sprouts as a kid, but back then, they were never roasted… nor cooked as good as this. Thanks! Ours were frozen. I don’t think they even had them in the produce section! Oh wow! Brussels have never looked so good!!!! Thanks! I’ve been meaning to stop by and see you! You are so right, I most often tend to steam my veggies without much other effort. But I did roast some asparagus with parmesan the other day. Quite a step up for me! Great idea for the brussels sprouts, we are a fan of those too. I think asparagus and artichokes are my fave vegetables, with brussels right behind! I love roasted asparagus!! Oh sweet Jesus that looks divine! And so easy! I actually have all of the ingredients in my refrigerator right now and was in fact trying to figure out what to do with my leftover brussel sprouts. So now I know what’s for dinner! You’re awesome as usual. Thanks much! This is a fave recipe. I sometimes just eat it for dinner! So I made this tonight with some roast chicken. It is absolutely out of this world. Definitely going on the regular rotation for dinner. Thank you so much. I love sprouts. Maybe Hubby will eat these because he loves cheese! Hi Nancy, just a spoonful of sugar, or in this case cheese?!! I will definitely be trying this! My husband adores sprouts. I usually fry them with onion, garlic and lardons but your recipe looks like a brilliant alternative!